From the sprawling green lawn to the wrought iron fence that surrounds it, it’s impossible to miss the brick Georgian mansion anchoring the corner of Rivermont Avenue and Langhorne Road. The 1911 building has gone through many incarnations since its initial construction as the personal home of Phillip Krise. Some may know it as Kriselea or Oaklawn, others call it the Villa Maria Academy, but Todd Leap and Mark Little simply call it home. 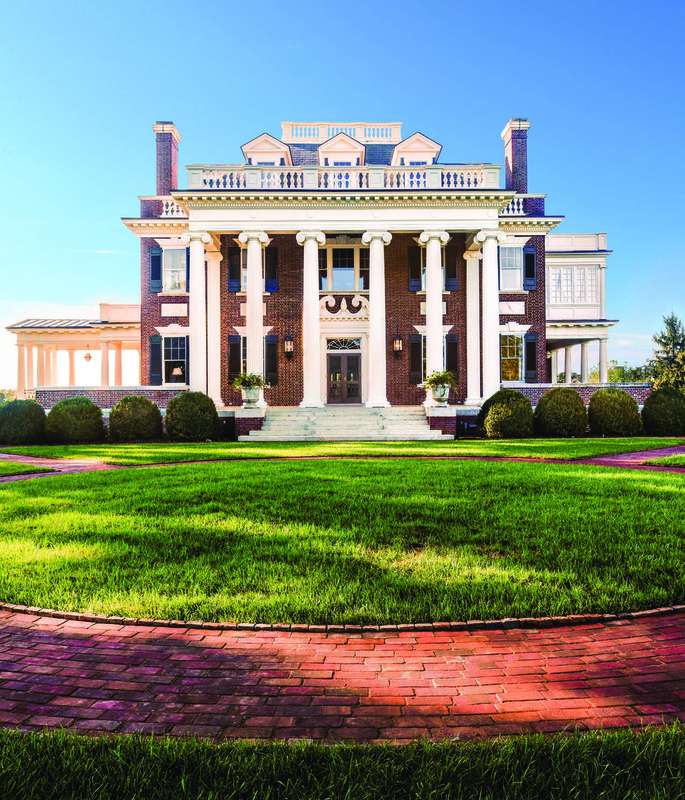 Mark and Todd essentially rescued the Villa from disrepair when they purchased the estate in 2013. Like many Lynchburg locals, Mark, who grew up in Campbell County, remained fascinated by the landmark. “We joke that a few hours after he was born at Virginia Baptist Hospital, Mark looked out over his car seat and turned his head to look at the Villa, and that’s what started it all,” laughs Todd. In the 15 years the couple has been together, Mark has maintained—half-jokingly—that if the Villa ever went up for sale, he wanted to buy it. Todd, who is from Conneaut Lake, Pennsylvania, met Mark in 2001 while they were both living in Washington, D.C. Mark worked as an executive for Neiman Marcus and Todd owned and operated a company that handled government contracts in IT and healthcare. When Mark’s mother suffered complications from a series of strokes, he decided to return to the Lynchburg area to take care of her and his twin sister, Christy. For nearly a decade, Todd traveled every weekend from Washington to Lynchburg. Mark and Todd, who are now private investors, will be celebrating five years of marriage in October. From a structural standpoint, things looked solid: Previous owner Krise implemented as much fireproofing as was available in 1911, so the walls are brick covered in plaster. However, the interior and exterior cosmetics had fallen into a serious state of disrepair. In addition to the grounds, Mark and Todd knew that they would have to completely reinvent a kitchen, repair plaster, and gut the basement in addition to their plans to install an elevator for disability access. The family hoped to have Mark’s mother join them in living in their dream house, but Mrs. Little passed away in 2015 before the interior renovations were complete. Even though they had general ideas of what needed to take place in the house, they waited a solid six months before beginning any work and solidifying plans. “We wanted to respect the architecture and grandeur of the home and wanted to spend sufficient time within the space prior to making any significant changes,’” Mark explains. As general contractor, Mark spearheaded the undertaking and elected to use the same subcontractors he hired when he renovated his Diamond Hill district home, including local carpenter Sam Buck. The space is massive at 15,000 square feet, containing seven bedrooms, six bathrooms, a study, a gym, and access to a widow’s walk from the third floor. Rumor has it that the widow’s walk offers the highest vantage point in all of the Hill City. The first phase of the garden restoration began with the landscaping, with Charlottesville landscape architect Charles J. Stick at the helm of this project. Mark and Todd are currently preparing for the second phase of their five-year landscaping plan, with phase three on the calendar for 2018. “Every single tree and plant around the property needed tending or replanting,” Todd explains. They also had to remove all the English boxwoods around the perimeter of the house due to neglect and disease, replacing them with 3, 4, and 5-foot American boxwoods. They have also added 330 boxwoods of various sizes where needed. Another modification to the exterior includes the removal of a drive to the carriage house in order to terrace the land for a new potager garden, along with new hardscaping and a new swimming pool, implemented and installed by Land Tech, a Lynchburg pool and landscaping company. 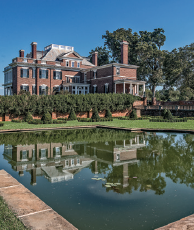 Charles Freeman Gillette’s original 1930s design for a reflecting garden on the property included a reflecting pool, serpentine wall and brick arbor; this space was barely recognizable when Mark and Todd purchased the property. As historic preservationists, they have worked to revive and replicate the Gillette garden as closely as possible to its initial outline and to use existing materials when viable. For example, when Mark and Todd saw the need to repair and replace the sidewalks, they opted to use the bricks that were still in good condition to create the pathways’ decorative borders. Out front, the original portico leads straight into a grand hallway, featuring an egg-and-dart ceiling. A formal stairway features intricate spindle designs, and original molding with Greek key and floral carvings. 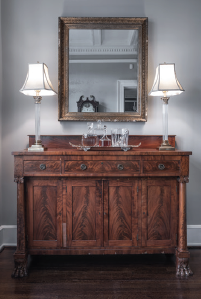 The wide hallway is bathed in light from ample windows and French lanterns that date back to the 1820s, a find from the family’s visit to Louisiana. To the left is the formal living room, with one of the home’s nine fireplaces as the focal point. Complete with fine furnishings, oil paintings, pottery and plants, the muted reds and blues of this room shine thanks to light gray walls and neutral drapes. 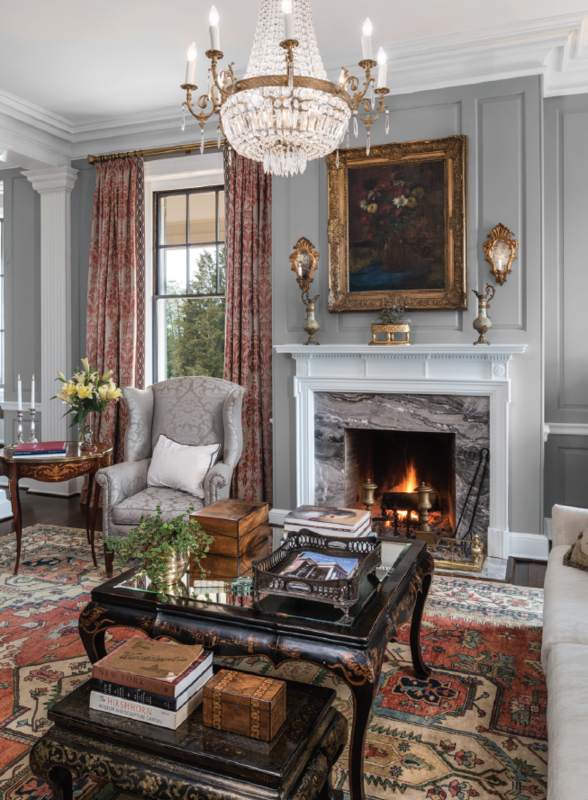 “The gray is just so versatile and classic, and so elegant with the white trim and the artwork,” Mark says, noting that this color scheme makes it easy to add color with pillows, rugs and other accessories. 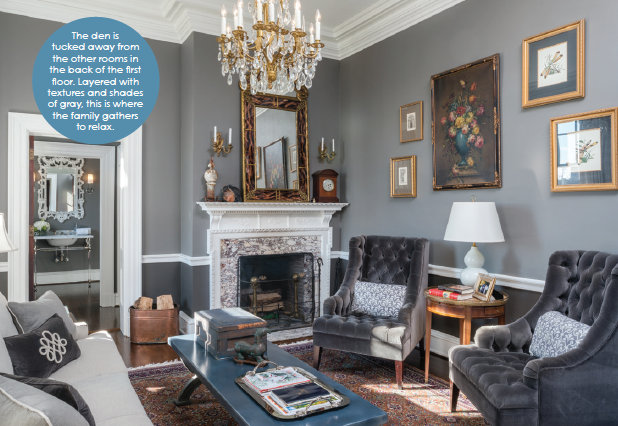 From the lighter shades like Sherwin Williams’ Mindful Gray and Dorian Gray all the way to darker variances of pewter, such grays provide the backdrop for the family’s personal treasures to shine. Adjacent to the living room lies a dramatic charcoal-colored dining room with a long oval pedestal table at the center that seats eight and can extend with its two leaves. The gas coals in the fireplace (ideal for smaller fireplaces and period decor), made in England, illuminate the original marble surround. A gilded mirror and chandelier add shine and refinement to the space; the chandeliers are another design mainstay throughout. The temple jars on the mantelpiece add mystique and history; they are just a few of the furnishings that remain from the first homeowners. Mark and Todd obtained those, along with a planter and ewers, from a private dealer. 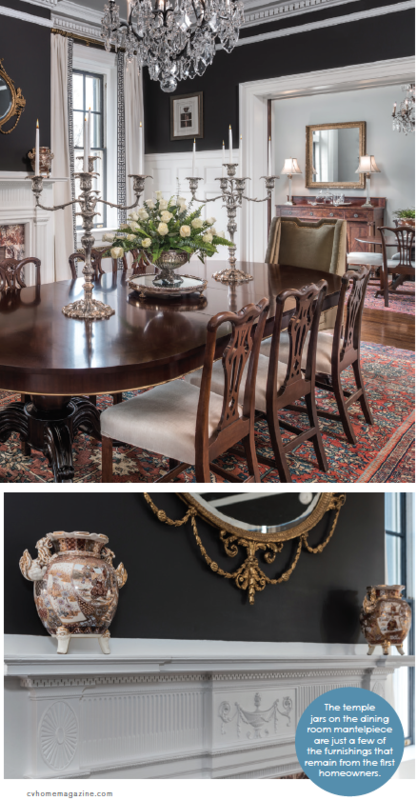 Todd and Mark enjoy hunting for and collecting unique pieces; at the Villa, the decor stems from pieces from their own collection as well as items from estate sales and other art collectors. The room flows into what Mark and Todd refer to as their morning room, which is ideal for expanding entertaining space—like when they host holidays with Todd’s large family (23 relatives came for Thanksgiving). 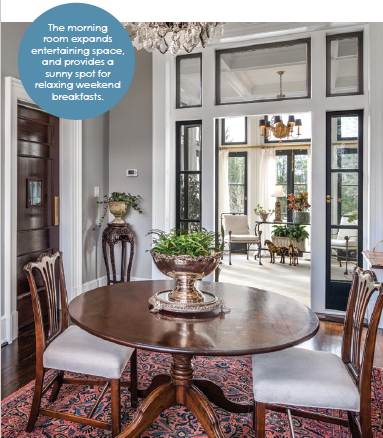 Otherwise, the morning room provides a perfect sunny space for enjoying relaxing weekend breakfasts. Most mornings, however, Mark and Todd choose to eat a simple breakfast at the kitchen table in their all-new, eat-in, chef’s kitchen. Among the interior renovations, not only did Mark and Todd need to replace the heating system and add air conditioning, but there also wasn’t a place to prepare food. “There was no kitchen, per se—no appliances or sink. The room where a kitchen had been was there,” Mark explains. While in the throes of this major renovation, the couple also decided to add a small mudroom and run the elevator through this back wing. 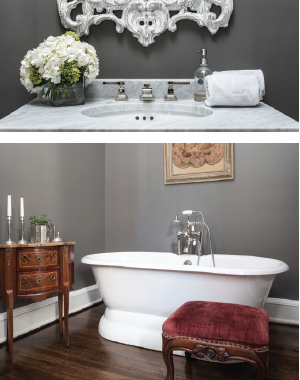 When first seeing the custom cabinetry painted in a custom color and the double-thickness statuary Carrara marble countertops, one could barely imagine the work that went into creating this space from scratch. 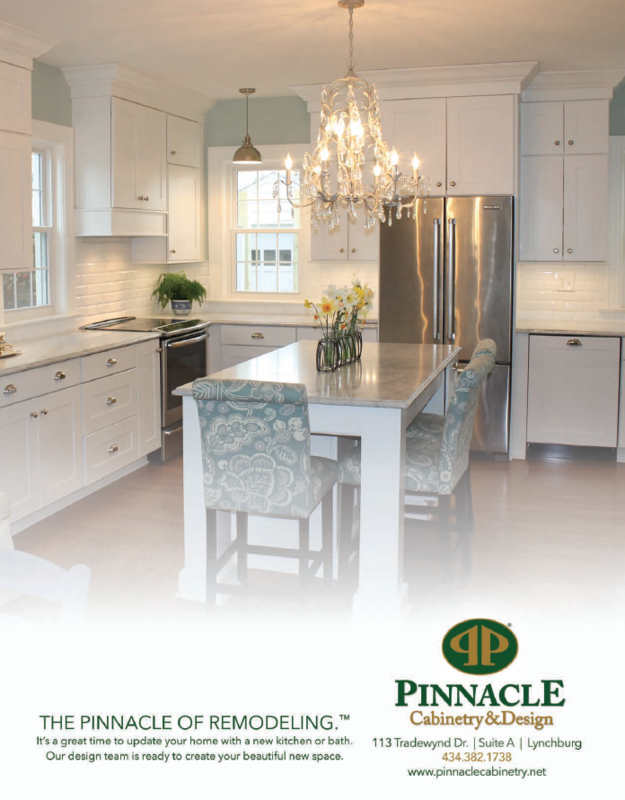 Mark designed the kitchen himself, serving as general contractor and using subcontractors for specific tasks. 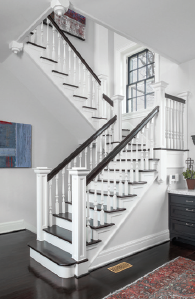 Peter Kerschbaumer fabricated the cabinets, reconfigured the staircase and completed all of the woodwork and millwork, including an exact replica of banisters on the steps that lead to the second floor back hall and bedroom with en suite bath. In addition to the staircase project, Mark and Todd removed all the interior walls, including a bearing wall, which necessitated craning in a steel beam to install between the exterior walls in order to make the room structurally sound. With so much effort taken with the kitchen, it’s no surprise that the family eats almost every meal here. With amenities like a designated prep sink, Subzero refrigerator, and double oven Wolf range, it’s a true cook’s kitchen. Both Mark and Todd love to cook and joke about who the better chef is: “Todd is absolutely the better cook…even though I cooked for Thanksgiving!” Mark laughs. 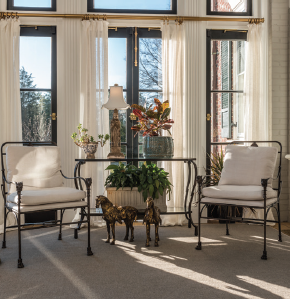 Passing back through the morning room leads to the solarium, a spot for reading, chatting and relaxing featuring cheery orchids, plants, and a planter from the original owners of the Villa. Custom draperies dress the windows here and throughout most of the home; all of the drapery hardware comes from Restoration Hardware. 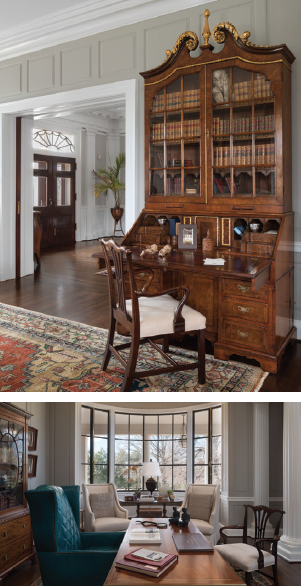 Across the hallway from the dining and living rooms lies a spacious library that spans the length of its opposing rooms. Todd explains that this room served as the chapel during the era of the Villa Maria Academy. The library and living room both have entrances marked by pocket doors. “We had the doors recreated and had Ken Faraoni completely recast the hardware to replicate the original,” Todd explains. Faraoni, a local bronze artist and sculptor, is also working on a sculpture for the garden. In spite of the 12-foot ceilings, the room manages to affect a cozy atmosphere by using warm earth tones, natural wood, and spots of turquoise. Adorned with filled bookcases, family portraits and a fireplace, the room offers several comfortable spots for reading, reflecting and working. “I love sitting in the nook at the back of the library, because of the chairs and the lighting,” Todd says of this cozy spot. The only room that might provide an even greater sense of coziness is the den, tucked away from the other rooms in the back of the first floor. Layered with textures and shades of gray, this is where the family gathers to relax together, and even the 55-inch flat screen TV gets a dose of history; it resides in an authentic wedding armoire dating back to 1765, with newlyweds’ initials carved plainly into the front of the furniture. A box made by Mark’s grandfather sits prominently on the coffee table.